Is it insane to hold an open house in Costa Rica or does it make sense to forget about it and promote the sale of your house in a different way? If you ask the seller of the home, you will get one answer. If you ask the real estate agent, you will get another. And the neighbors will give you a totally different answer. The concept of an open house — where you open the doors of a home for sale to anybody who wants to tour it — was created before the Internet existed. Now, real estate offices use virtual home tours, slideshows, video and even drones to show aerial footage. You can see a house inside out, without even driving to it. Have you ever seen invitations for an open house in Costa Rica? I have not. Well, maybe a few organized by real estate brokers for real estate brokers. Let’s start with the neighbors. They love open houses. They’ve been dying to get into their neighbor’s home for years but were never invited. Now they’ll be invited and can roam your home and even look in your closets without interference. Will a neighbor purchase the house? I doubt it, but you never know. So will holding an open house sell the house faster? Many foreign sellers of a property in Costa Rica assume that the listing system here works more or less the same as those back home. When there is a formal multiple listing service (MLS), the seller chooses the best possible listing agent to attract potential buyers quickly. By signing an exclusive listing agreement with the agent, the seller can expect broker cooperation. In some countries, one open house for buyers and another for real estate agents may be enough to sell a house in a week, or at least collect several offers. None of that will happen in Costa Rica, where it would take a miracle to sell a house in a week. There is no broker cooperation, no list of people ready to buy. I wish our real estate market were so perfect. Only a real estate agent with an exclusive listing agreement from the seller would invest the money, time and effort to hold an open house in Costa Rica. There is not much broker cooperation here, and the lack of a formal MLS doesn’t promote the use of an open house as a marketing tool. You will find very few agents using open houses to market a property. We have two types of buyers of Costa Rica real estate: local and international. An open house in Costa Rica is useless to someone who is in Arizona, China, France or Polynesia on the day of the open house. So let’s have a look how a local buyer behaves. Costa Rican real estate buyers shop around forever. They start shopping a long time before they even decide to put their house on the market. Most local buyers do not use a real estate agent to look at properties. They look on Facebook, for sale by owner, newspapers and drive around neighborhoods looking for signs. I’m sure they would love those yard signs that say “Open House.” You might get hundreds of visitors opening your closets, using your bathroom and probably even looking into your fridge. Does it make sense to hold an open house in Costa Rica? Personally, I would advise against it. I think it’s a waste of time and effort and there are many better ways of promoting a property for sale. 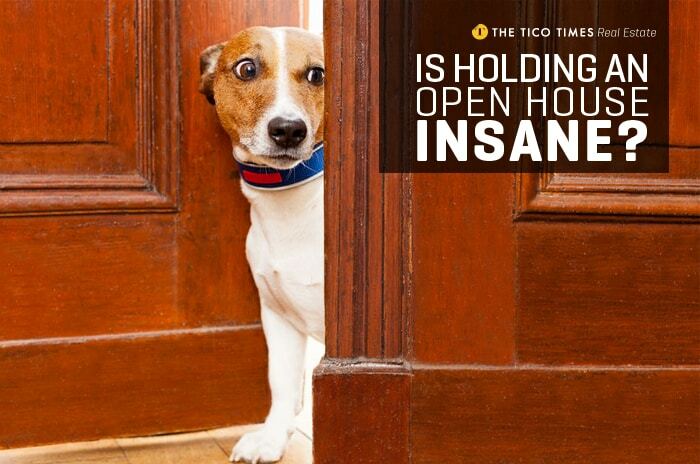 There are many reasons that an open house doesn’t make sense in the Costa Rican real estate market. The main reason is the lack of a formal MLS. All the above does not mean you shouldn’t try to hold an open house in Costa Rica. Advertising an open house can be as easy as posting it on Facebook, asking your friends to spread the word and posting a sign on your gate. 1. Drive up to your house yourself and look at it through the eyes of a buyer. Check your curb appeal, cut the hedge, paint the gate, cut the grass and clean up the dog poop. 2. Get rid of all the clutter. Throw out everything you don’t want to take to the next house or give it away. De-clutter every room, one by one. Get the house ready to show, paint wherever necessary and fix anything that needs fixing. Don’t hold an open house before your house looks picture-perfect. 3. Put away all your valuables, photos and any other personal items you don’t want strangers to see or touch. 4. Meet with your real estate agent, discuss and formulate a sound strategy: who to invite to the open house, how to advertise it, where to put signs. Don’t forget the guest book so all visitors can sign in and leave their name, phone number and email address. 5. Bear in mind that security may be an issue, so ask for assistance from friends or relatives.